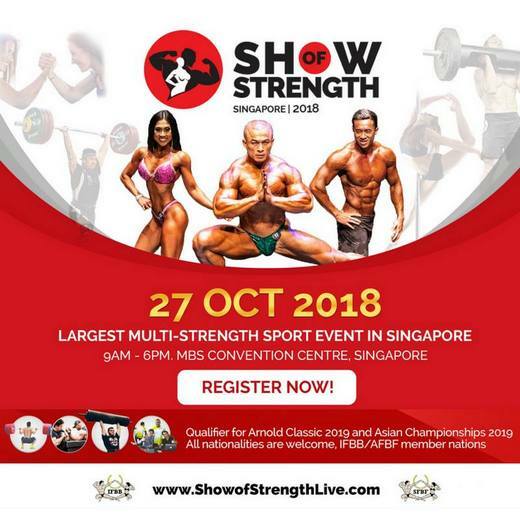 The Show of Strength 2018 is Singapore’s Largest Multi-Strength Sport Event and will be held at Marina Bay Sands Convention Centre in Singapore on October 27th, 2018. All events and activities are to showcase the feats of strength that potentially everyone has – both in physical and mental form. Bring your family and friends to mingle with athletes from all over the world who come together to present their years of dedication and hard work on stage for competitions such as Bodybuilding, Log Lifting, Axle Deadlifting, Armwrestling and CrossFit. Some of the audience activities include Pole Dancing, Armwrestling, Strict Arm Curl, Push Up Challenges and more! You will also be able get up close and personal with many different brands and celebrities in the health & fitness industry. – Goodie Bags containing products from generous Sponsors.